This tower is a major landmark in Dijon and also offers great views. The Tower of Philippe Le Bon (map) looms over the Palais des Ducs de Bourgogne and the Place de la Libération in the center of Dijon. At night, it's illuminated in blue so that it stands out from the rest of the Palais. During the day, if you have good legs you can climb the 316 steps to the top of the tower and enjoy wonderful views of Dijon and the surrounding area. Tickets are available at the Tourist Information Office, and you'll climb with a guide, who kindly stops periodically to explain some of the interior decoration and use of the tower, giving you a chance to catch your breath. You'll pass a variety of doors that led into private chambers (today part of the Musée de Beaux Arts or other areas of the Palais des Ducs). Note that the Tour Philippe Le Bon is closed Mondays year round. Between late November and April, the tower is open Tuesdays, Saturdays, and Sundays. Because of the small size, visits are scheduled and are limited to 18 people, so you will want to reserve your place in advance and pay the admission fee of 3€. The tower dates from the 15th century and was built by Philippe Le Bon (Philip the Good), Duke of Burgundy from 1419-1467. He is noted for bringing Burgundy prosperity and prestige, and positioning it as a center for the arts. Considered the most powerful of the Dukes of Burgundy, he switched allegiances between France and England in order to maximize his power. His court was known for its elegance and style, as well as its extravagance. In celebration of his marriage to Isabella of Portugal, Philippe created the Order of the Golden Fleece (Toison d'Or), a prestigious order of chivalry which was bestowed on 24 selected noblemen. 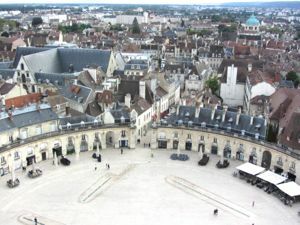 Above, View of the Place de la Libération from the top of the Tour Philippe Le Bon. 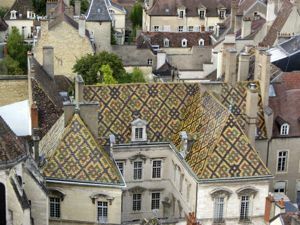 Below, Colorful tile rooftops of Dijon seen from above.